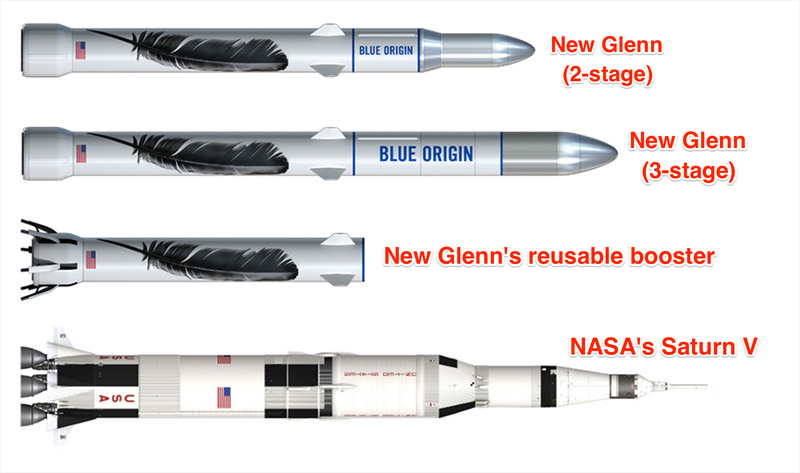 Blue OriginBlue Origin’s New Glenn orbital rocket system compared to NASA’s Saturn V rocket, which took astronauts to the moon. Just over a week after SpaceX’s launchpad rocket failure, Blue Origin — the aerospace company owned by Amazon.com founder Jeff Bezos — has revealed its ambitious plans to build a “New Glenn” launcher. The largest of the two new rockets, called the “New Glenn 3-stage,” is an enormous 23 feet in diameter — about half the length of a school bus — and 313 feet tall, which is close to the height of NASA’s Saturn V moon rockets used during the Apollo program. And with 3.85 million pounds of thrust, the rocket could be more than half as powerful as the Saturn V.
Unlike the Saturn V, however, Blue Origin plans to build on its rocket-recycling experience and reuse the giant first-stage booster of each launcher — saving untold cash over multiple launches, since rocket boosters are normally trashed in the ocean. Bezos has said he hopes to make space travel as routine as aeroplane flight, and has compared typical non-reusable rockets to using a 747 to fly across the country once and then throwing the plane away. Building, flying, landing, and re-flying New Shepard has taught us so much about how to design for practical, operable reusability. And New Glenn incorporates all of those learnings. 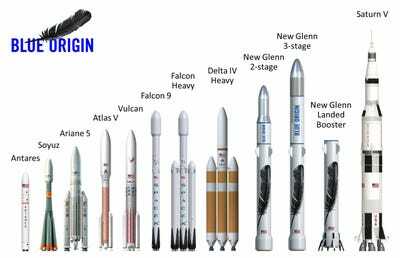 Named in honour of John Glenn, the first American to orbit Earth, New Glenn is 23 feet in diameter and lifts off with 3.85 million pounds of thrust from seven BE-4 engines. Burning liquefied natural gas and liquid oxygen, these are the same BE-4 engines that will power United Launch Alliance’s new Vulcan rocket. The 2-stage New Glenn is 270 feet tall, and its second stage is powered by a single vacuum-optimised BE-4 engine. The 3-stage New Glenn is 313 feet tall. A single vacuum-optimised BE-3 engine, burning liquid hydrogen and liquid oxygen, powers its third stage. The booster and the second stage are identical in both variants. We plan to fly New Glenn for the first time before the end of this decade from historic Launch Complex 36 at Cape Canaveral, Florida. New Glenn is designed to launch commercial satellites and to fly humans into space. The 3-stage variant — with its high specific impulse hydrogen upper stage — is capable of flying demanding beyond-LEO missions. Our vision is millions of people living and working in space, and New Glenn is a very important step. It won’t be the last of course. Up next on our drawing board: New Armstrong. But that’s a story for the future. Disclosure: Jeff Bezos is an investor in Business Insider through hispersonal investment company Bezos Expeditions.